There is a lot of confusion in the business community when it comes down to understanding the nature of information services offered by various hardware and software vendors. For the last few years, there has been a lot of buzz around cloud computing and several different flavors have been offered that add to confusion for many organizations. There are various “cloud” forms that are being offered in the market including public, community, private and hybrid cloud solutions. Additionally, there are other forms based on type of service being offered such as Infrastructure as a Service (IaaS), Platform as a Service (PaaS) and Software as a Service (SaaS). Then within each of these there are sub categories to add to the confusion. Regardless of the format of the offering, the organizations need to first understand what a cloud is and the real reasons to have one and how it can provide their information service needs to achieve overall positive business outcomes such as Revenue Acceleration and Total Cost of Ownership Reduction. We at AVIGNA describe CLOUD as Consumers Leverage Over Usage Demand. What that really means is that you as the consumer has the complete leverage over your demand for information services based on your specific usage profile. The services leverage is around any type, any quantity, anytime, anywhere and by anyone who has any need of those services. This sounds very promising but in reality it is very complicated due to the existing business operating models. That is one of the reasons for the existence of a variety of CLOUD flavors. Many businesses struggle to evaluate the associated business risks by moving in this new direction especially when they do not even fully understand existing risks in their current environment. While the new model makes business sense, there is little doubt that this new operating model further complicates risk evaluation and slows down the decision of embracing the cloud. Your organization can move faster in evaluating cloud opportunities. In your evaluation of the cloud offering, you as the decision maker must ask, as a minimum, the following three questions. First, is the service being offered Elastic in nature? Your users should be able to dynamically scale in and scale out the resources as needed. For instance, if you need 1 unit of service on day 1, 10 units on day 2 and 5 units on day 3, the offering should be able to accommodate without any additional time consuming change requests and you as the consumer should only pay for units you actually consume. Second, is the service Agile in nature? Your organization should have the ability to use any portion of the required services from anywhere, anytime and for anyone you choose to select. For example, if your organization wants its time sheet application to be available to all its employees and contractors from any location anytime, then offering should be able to meet the functionality in its simplest form. Third, is the service Secure to use? Your organization must be able to ensure the service provides confidentiality and integrity along with availability. For example, the offered service must be able to encrypt your data and provide mechanisms that ensure data is transmitted between desired systems without any data compromise. Trust is an important factor that enables quicker adoption of cloud services and the goal must be to achieve lowest possiblerisk tolerance. AVIGNA is in the business of solving problems and enabling success for our customers, partners and our organization by providing network and cloud security centric solutions that help businesses meet their objectives by offering EASIER CLOUD solutions framework. 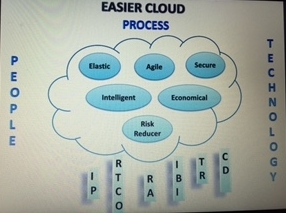 Our goal is to help you achieve lowest possible risk tolerance level when migrating to any CLOUD operating model. We are able to do that by offering balanced solutions around People, Process and Technology. Our differentiated value ADD proposition to you is our Assessment, Design and Delivery methodology around these three success pillars. We believe that in order to achieve the lowest risk level, your business must continuously improve its human capital by proactively training, especially around security awareness; optimize your business by improving existing processes, especially around acquisition of services and their delivery; and strengthen information services by embracing innovations in technology, especially those which reduce business risk. AVIGNA takes this unified approach in developing long term partnerships with our vendor partners and your organization to make EASIER CLOUD a real outcome. We look forward to further discussing with you in much more detail how EASIER CLOUD can be realized within your organization. Contact us now at 703-972-4455.